Larne pair Danielle Hill and Conor Ferguson were among the winners on day two of the Irish Open Swimming Championships. Hill returned from injury to win the 50m women's freestyle in 25.77 at the National Aquatic Centre in Dublin. Ferguson took the 50m men's backstroke title in 25.32. Darragh Greene broke Andrew Bree's 11-year-old Irish men's senior record in the 200m breaststroke by winning in 2:10.05. Greene was under the consideration time for the World Championships for a second day in row as he followed up his impressive 100m breaststroke success. 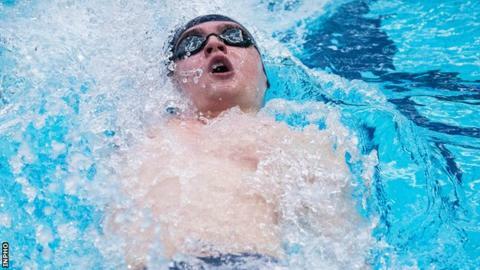 Shane Ryan won the 100m men's freestyle final in 49.71 with Bangor's Jordan Sloan second (49.71) and Robbie Powell (49.71) third. Niamh Coyne doubled up on her gold medals in the women's 200m breaststroke to take the national title. Scotland's European, World and Commonwealth Games medallist Hannah Miley was first home in 2:29.40 and just ahead of Coyne, who clocked 2:30.09. Miley returned to action in the final event of the night, the 400m individual medley, and took a second commemorative gold medal in 4:47.63. Templeogue's Ellen Walshe claimed the national title in 4:51.04 with Ards' Amelia Kane second in 4:45.70 to join Eoin Corby in going under the consideration times for both European and World Junior Championships. Limerick's Edel Daly retained the 800m freestyle title in 9:15.03, cruising to victory ahead of Trojan's Grace Hodgins (9:19.74) and Leander's Ella Donegan (9:20.71).